Sure, The Cell made its 2000 debut in 2,411 theaters and Tarsem Singh himself made waves when his epic of a passion project, The Fall, finally hit theaters after years of development and production (including 17 years of location scouting and a four-and-a-half-year shoot in 24 countries), but it wasn’t until Immortals arrived back in November of 2011 that Singh finally earned more widespread clout for his mesmerizing visuals. 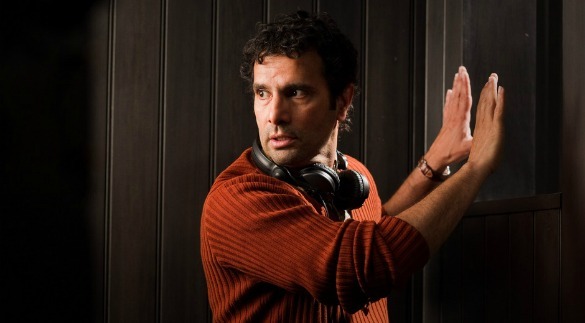 Even as Immortals was still in post-production, Singh was hard at work on what’s bound to be his next visual romp: his take on Snow White, Mirror Mirror. I did the whole high school party thing back in the day, and things did get crazy once in a while, but I never ended up with a midget in my oven. Have you seen the trailers and clip for Project X? These kids are out of their minds. But, hey, I get it; it was all about upping each other to claim party glory. You had to go big to make it memorable. Based on what we’ve seen so far, Project X looks to raise the stakes big time, but it’s also got some serious competition to become one of the best of the best as far as school party movies go. Where willProject X fall come March 2nd? Here’s the good, bad and bogus of school party movies to give you a sense of the lay of the land. Can I even label this an interview? If you’ve seen Tim and Eric Awesome Show, Great Job! on Cartoon Network, you know what you’ve got coming with the comedy duo’s feature film Tim and Eric’s Billion Dollar Movie. Tim Heidecker and Eric Wareheim star as alternative versions of themselves – or is it? When the Schlaaang corporation gives the duo a billion dollars to make a movie and the Schlaaang bigwigs aren’t happy with the final product, they freak and Tim and Eric make a run for it. In an effort to make the billion dollars back, Tim and Eric respond to a television ad guaranteeing a billion dollars to anyone who can get a rundown mall back on its feet. Minus the fact that nobody spends a billion dollars making a movie (yet), that plot sounds rather sensible, right? What if I throw in some man-eating wolves, a sickly man-child named Taquito, a store that sells refurbished toiler paper and a mall ghost called the yogurt man? Clearly these guys have a knack for coming up with some pretty silly stuff. 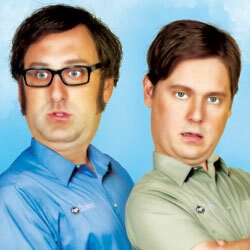 After seeing Tim and Eric’s Billion Movie, it was absolutely impossible for me to imagine these guys going into professional mode and making a movie, let alone leading relatively normal lives. Turns out, my instincts were right. Just before sitting down to chat with Tim and Eric, I caught this interview they did on Good Day Austin, but even with being determined to one up these guys and catch them off guard with my own ridiculousness, I was absolutely no match for them. Sure, director Paul Weitz is responsible for some excellent films like About a Boy and In Good Company, but with Little Fockers so fresh in my mind, it’s tough to remember what he’s really capable of. However, with Being Flynn, not only does Weitz go back to a more modest method of filmmaking, but he delivers a piece that’s incredibly grounded – almost troublingly so. Even in his father’s absence, Nick Flynn (Paul Dano) grew up wanting to follow in his footsteps and become a writer. With his mother (Julianne Moore) long gone, Nick is on his own in the big city, trying to pursue his dream. One day, Nick gets a call from his father, Jonathan (Robert De Niro), who’s in need of some assistance, as he’s being evicted. Rather than rekindle their relationship, their 18-year reunion stops there and both go their own separate ways; Nick takes a job at a local homeless shelter and Jonathan takes up residence on the streets. So far, so good for Nick at his new gig. He learns quite a bit from his superiors, taps into his honestly giving nature and strikes up a relationship with a co-worker, Denise (Olivia Thirlby). However, when Nick’s father drunkenly traipses into the facility, Nick starts to lose his footing. The Red Dawn remake is lucky the adaptation of John Marsden’s Tomorrow, When the War Began isn’t getting a wide release here in the states. It’d have some solid teens-band-together-to-fight-invaders competition. Tomorrow, When the War Began certainly suffers from some technical and acting issues, but the piece is so exciting and engaging overall you’ll undoubtedly be hoping for a sequel when the credits roll. Caitlin Stasey stars as Ellie Linton, a teen living in a small Australian town looking to take a little vacation with her friends before heading back to school. After assembling the optimal group of campers, she loads up her parent’s Land Rover and heads off to Hell, a lush secluded paradise deep in the woods. The trip is as magical as they hoped it’d be, but eventually, the time comes to pack up and head home. Upon arriving back at Ellie’s place, they find her home abandoned. While it doesn’t seem right, it isn’t until they find that all of their families are gone that they realize they really missed something while they were away. Turns out, their country is being invaded, their friends and family are imprisoned and now they’re the only ones left who can do anything about it. Surprisingly promotional material for potential Oscar nominees isn’t flooding the web with the Academy Awards on the horizon, but we still do have a slew of solid items to sort through. The Hunger Games and This Must Be the Place rock the poster department, each boasting a brand new banner bold enough to catch any eye. We’ve also got the very first poster for Tim Burton’s Frankenweenie and not only is it wonderfully reminiscent of the original, but it’s quite a gorgeous design in and of itself. Also showing some promise is the new behind the scenes featurette for Sam Mendes’ Skyfall. As a non-Bond fan, I was surprisingly enraptured by Mendes’ take on and passion for the series. There’s also a brand new trailer for American Reunion out there and while it does reuse quite a bit of the material from the former promos, it offers up a few new gags to ensure you’re still looking forward to seeing the gang get back together. Somewhat less fortunate, but nowhere close to getting sucked into “The Worst Stuff” is the trailer for Struck by Lightning. Chris Colfer certainly shows some potential as a writer and leading man, but the trailer isn’t as amusing as it could be. Piranha 3DD is also having some problems, as apparently the promotional department over there just couldn’t come up with any fresh poster ideas and opted to just Photoshop more fishies into the design for the 2010 film. Somewhat on the brighter side, Goon shows off an unexpectedly tame yet tense clip. It’s tough to see where this will fit into a film packed with such brutal humor, but Seann William Scott and Live Schreiber carry the moment well. Now that you’re all warmed up, how about the best and worst promotional material of the past week? It’s fairy tale adaptation madness out there. We’ve got two new TV series exploring a conglomeration of iconic tales, two Snow White movies going head-to-head and much more. 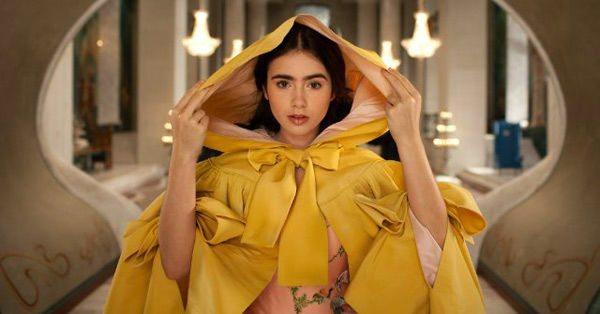 How to stand out in such a whirlwind of retellings? Throw a pot-peddling witch into the mix. 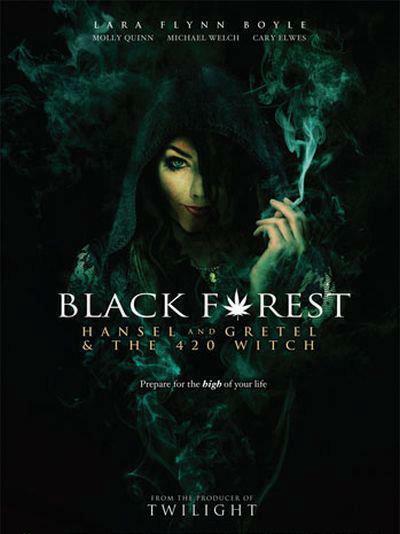 Director Duane Journey’s Hansel and Gretel & the 420 Witch is a modern retelling of the beloved fairytale which finds a rebellious Gretel (Molly C. Quinn) and her clean-cut brother Hansel (Michael Welch) going up against a local witch (Lara Flynn Boyle) that lures her victims in using a new blend of marijuana called Black Forest Night. Not only did we get the chance to talk to Hansel himself about working on the film, but we’ve got five exclusive stills to boot! Check it all out for yourself below.